I hope you all had a good time and I hope that 2007 brings you all you deserve. I had a nice time, pretty much. Not enough rest, and I didn’t get to see/speak everyone I had hoped to, but it was okay. And discovering that someone had decided that what the cars belonging to my girlfriend and her mother lacked were rocks. That’s right. Afterall, what use is a car without a rock or two? Luckily, whoever noticed this rectified it by putting some rocks into their cars – THROUGH THE WINDOWS. They really appreciated that. To whoever did this, one word: KARMA. 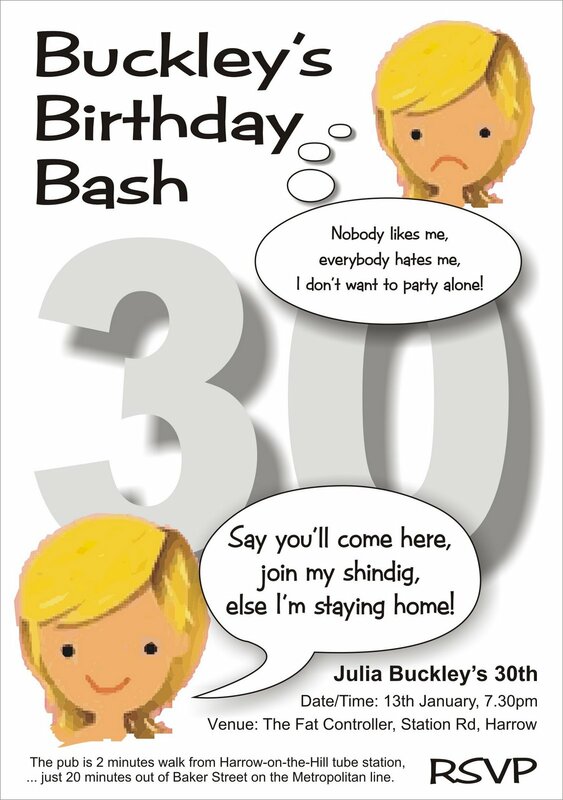 And in other news (see photo) the very lovely Julia Buckley is thirty soon and is having a party. She’s running an invitation design competition thingumy, the details of which are here. And as I mentioned before the holidays, my copies of the Bedtime Poetry Anthology, to which I have contributed, have arrived. I’ll upload a picture and more details soon. Thanks for the plug! Glad you had a good holiday. All the best for 2007.